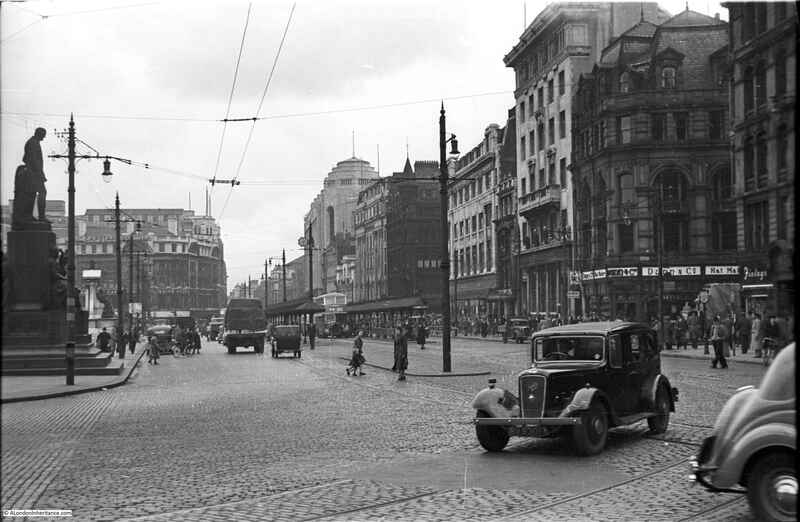 If you have been reading my blog for a while, you will know that I occasionally visit a place outside of London, as my father also took hundreds of black and white photos around the UK in the late 1940s and early 1950s. 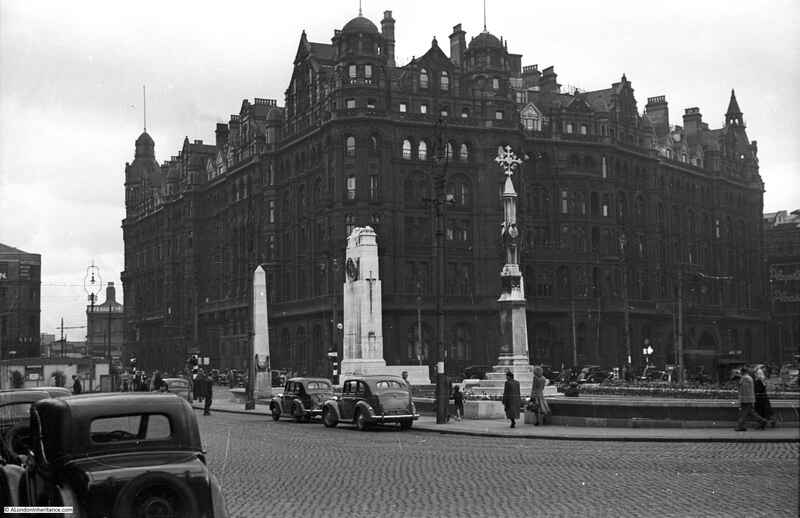 One of these places was Manchester in 1949, and last weekend we were in Manchester and I had a couple of hours for a walk in the centre of the city to find the locations of my father’s photos. It was not perhaps the best weekend for a visit. The so-called “mini beast from the east” was influencing the weather with snow, low temperatures and bitterly cold winds. 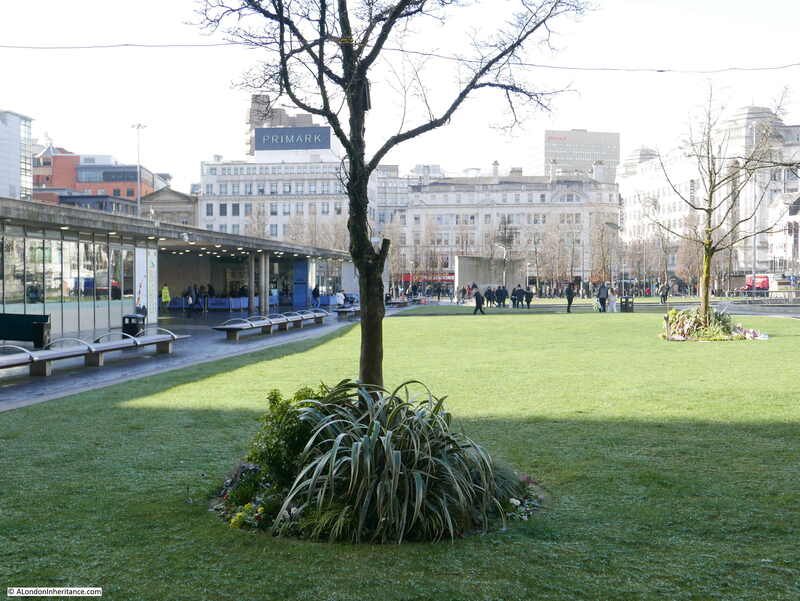 In the centre of Manchester at one moment it was blue sky, then five minutes later there was a blizzard of snow. 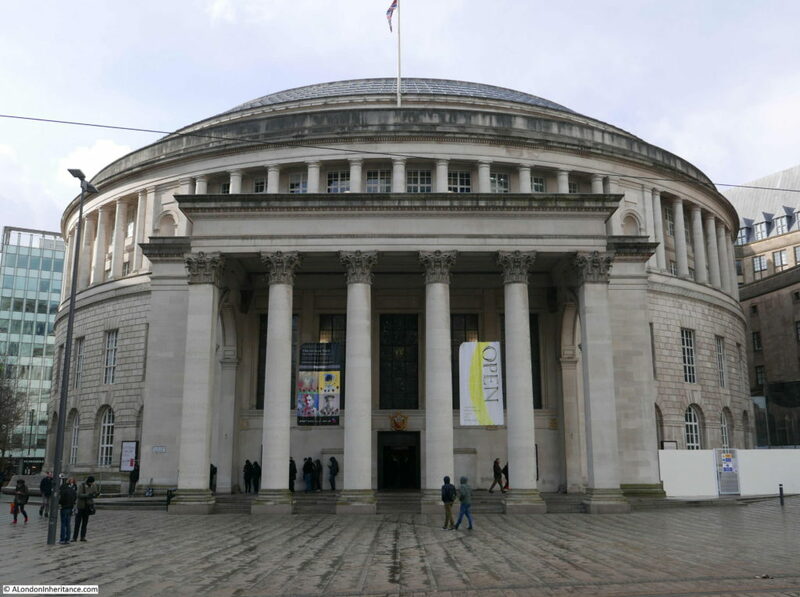 Manchester Central Library is a glorious building, the type of building I doubt we will see again. 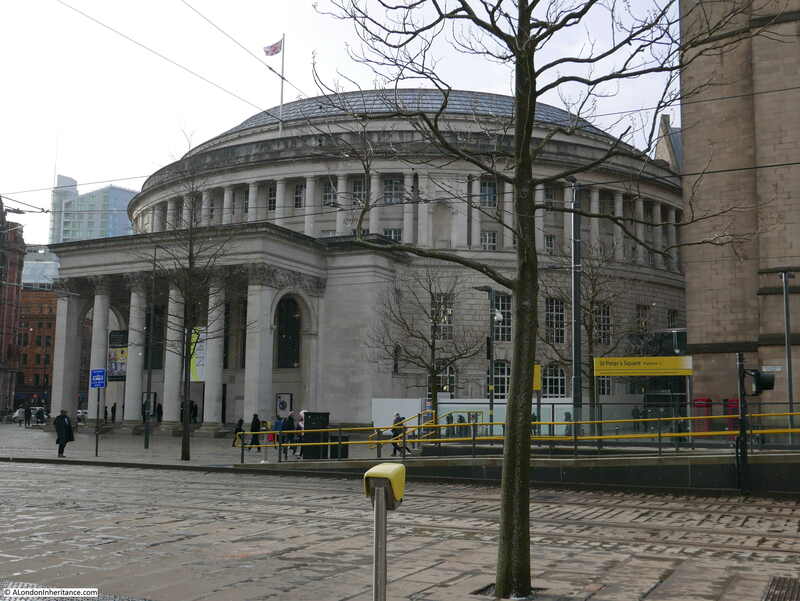 The first free library in Manchester opened in 1852 following the 1850 Free Libraries Act. 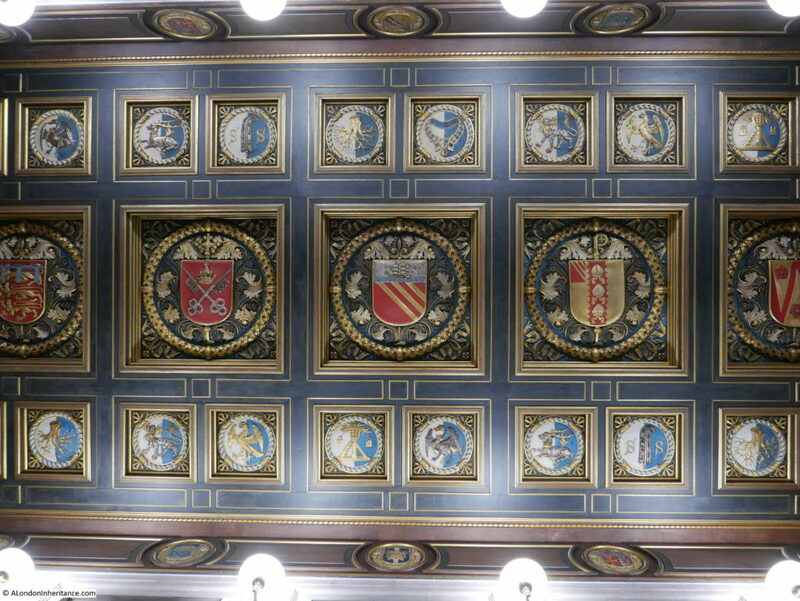 The Mayor of Manchester, Sir John Potter organised the collection of donations and subscriptions to establish a library. 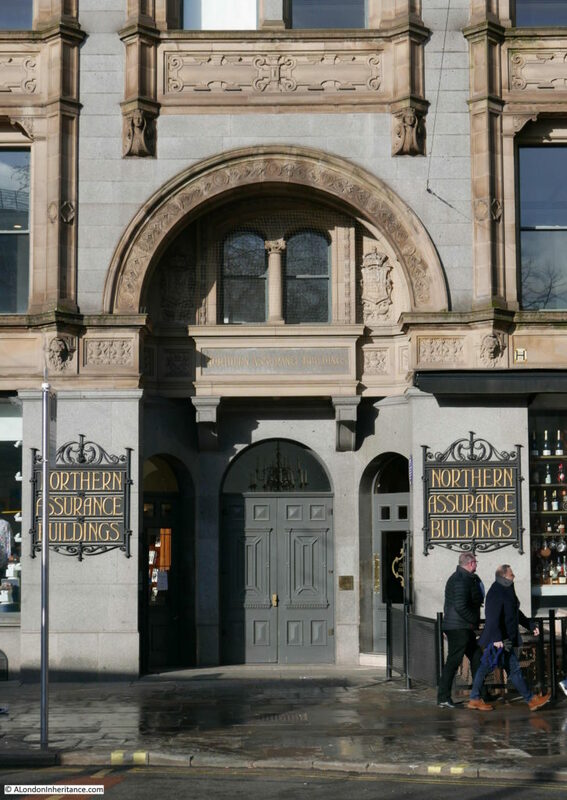 A building was purchased, stocked with books and opened in 1852. The Library soon outgrew the original building and over the following decades the Library would move through a number of different locations, none of which was a purpose designed Library building. 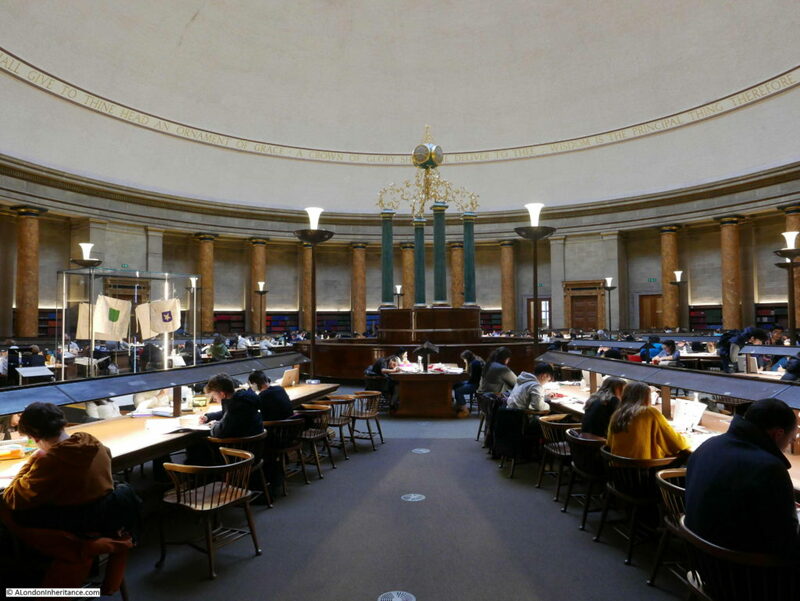 In 1926 a competition was held to design a new, purpose-built library building, and it was won by the municipal architect E. Vincent Harris. There are a number of examples of Vincent Harris’s work in London. 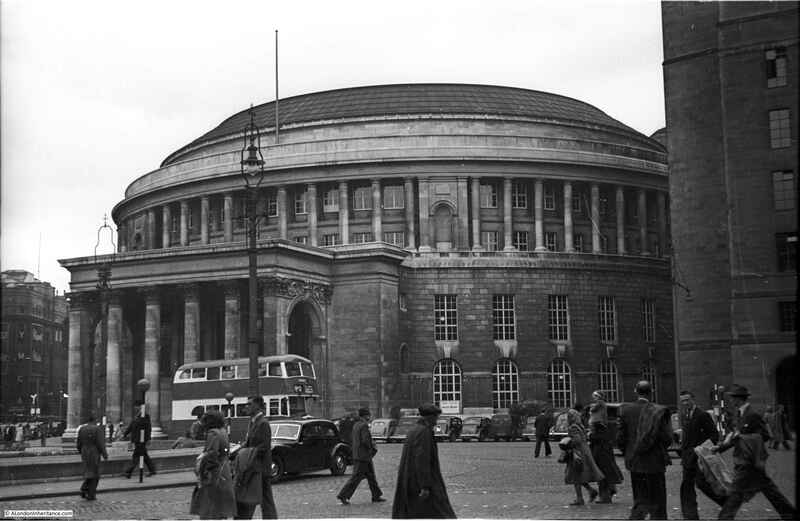 He also won the competition to design the Ministry of Defence building between Whitehall and the Embankment as well as Kensington Central Library. Construction of the building was from 1931 to 1934. The building is faced with Portland Stone, but has a steel frame. The Reading Room is at the top of the building with the book stacks on the floors below. The circular building has a Roman influence with the main entrance consisting of a large, two-storey portico with six columns and a thick, canopy roof. The above external photos were taken during a brief dry period, earlier it had been snowing heavily (luckily it was not settling on the ground), so it was the perfect time to have a look inside the building which is just as remarkable as on the outside. Through the entrance door and there is a relatively small entrance hall. Directly opposite is an entrance to the archives section of the library. 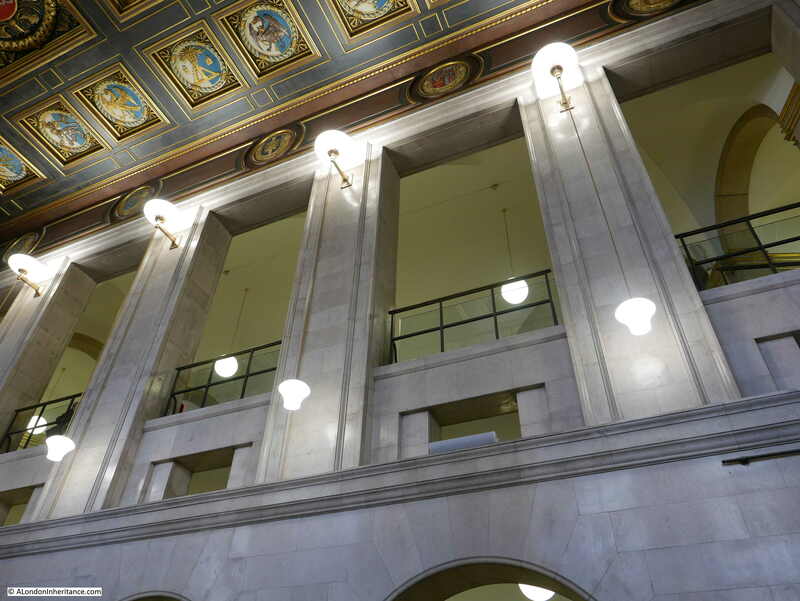 On either side are stairs which lead up to the reading room and looking up are large columns with open space between that opens onto the circular walkway that runs around the building at reading room level. 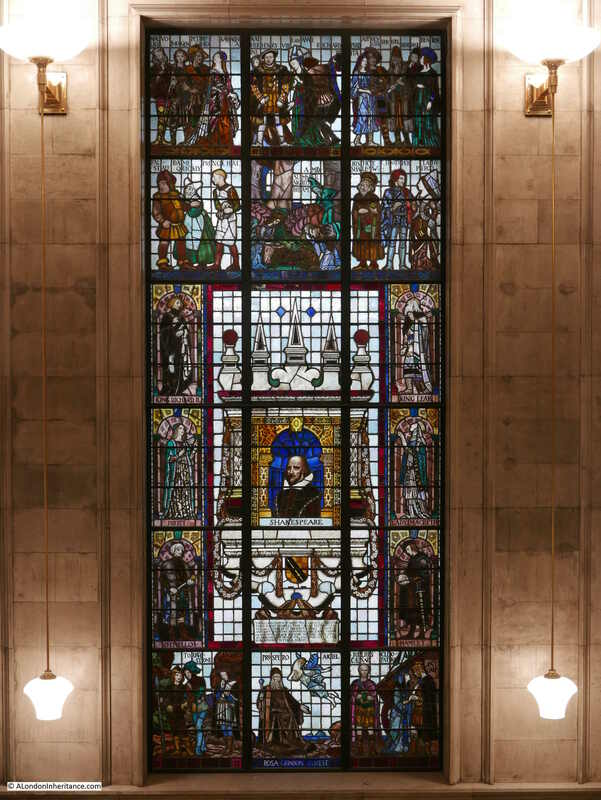 Looking across from the upper level at the entrance doorway (at bottom), a stained glass window in the middle and part of the roof at the top. I had my pocket camera with me rather than the larger camera with wide-angle lens so it was difficult to do justice to the interior of the building. Libraries are also places where you cannot intrude and take photos. 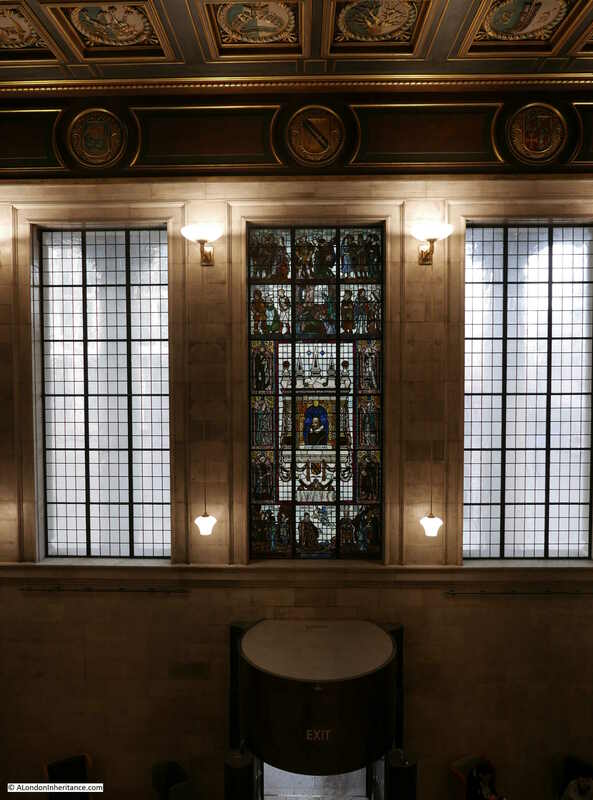 The reading room on the first floor is magnificent. 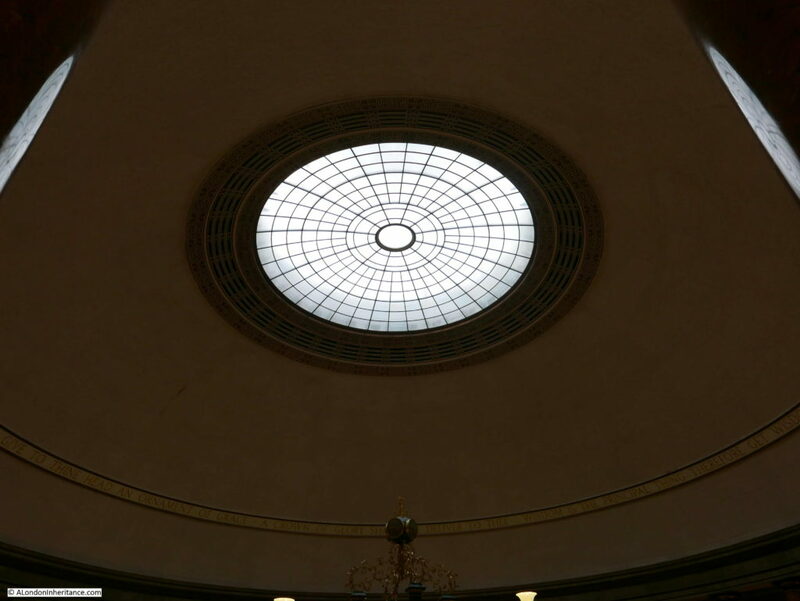 A large open area under a domed roof with a central roof light providing natural lighting. Desks radiate from the centre for the whole circumference of the reading room and at 3:30 on a Saturday afternoon the majority of the desks were occupied. The above photos really do not do justice to the interior of the building. Looking around the reading room, you wonder how many Degrees have been completed and books written in the room, or just reading for the joy of reading. 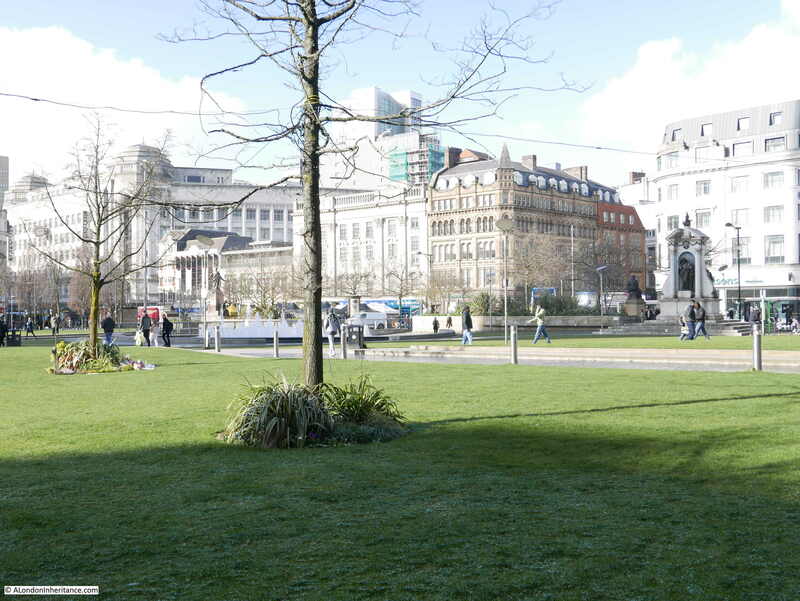 The area outside of the Manchester Central library and to the right towards the rear of the Town Hall is known as St. Peter’s Square. St. Peter’s Church was built in what were then mainly open fields outside the small Georgian town of Manchester, as it was before the industrial revolution. 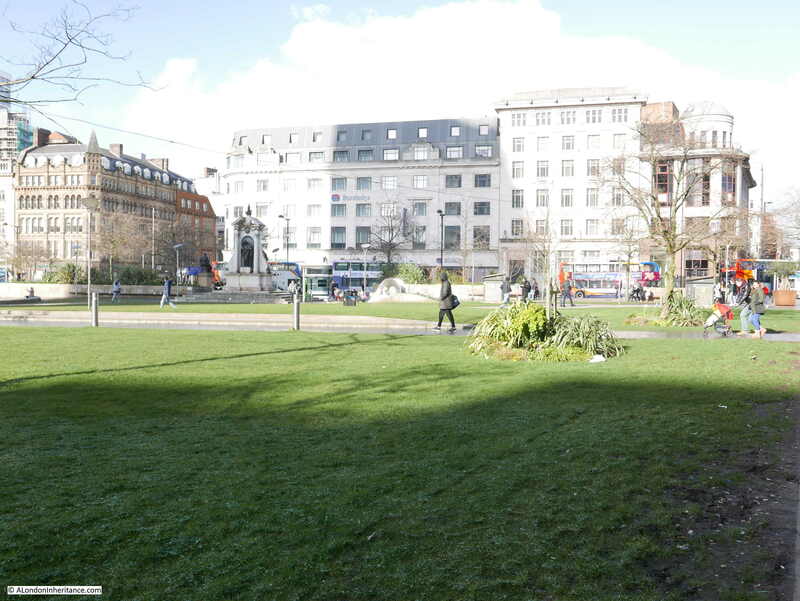 The area to the right in the photo above and my 2018 equivalent below was where the Peterloo Massacre took place. On the 16th August 1819, there was a meeting of around 60,000 people to hear the radical politician Henry Hunt call for reform of the House of Commons. The City authorities were concerned with the size of the crowds and called in troops to disperse the meeting. In the chaos that followed eleven people were killed. Henry Hunt was jailed for two years, although it was probably an over reaction of the City authorities to send in an armed force to deal with the crowds. 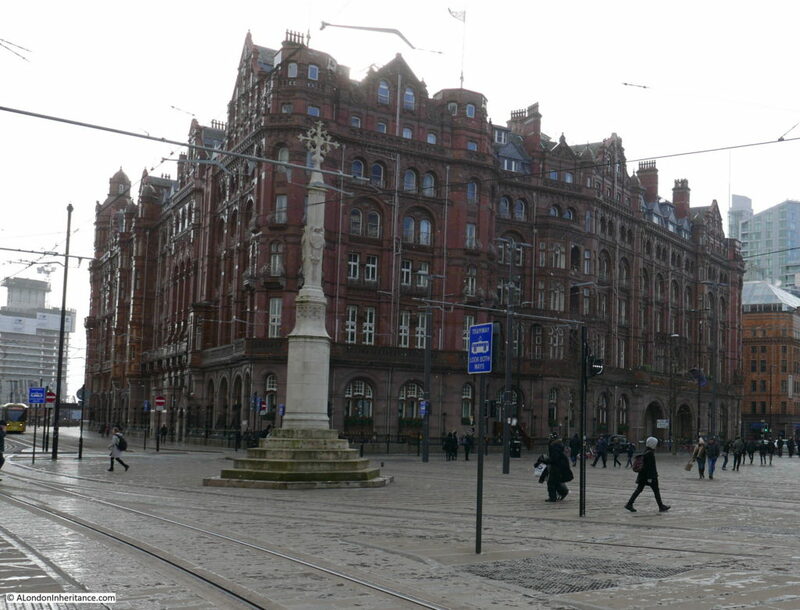 The building behind the cross in the above two photos is the Midland Hotel. 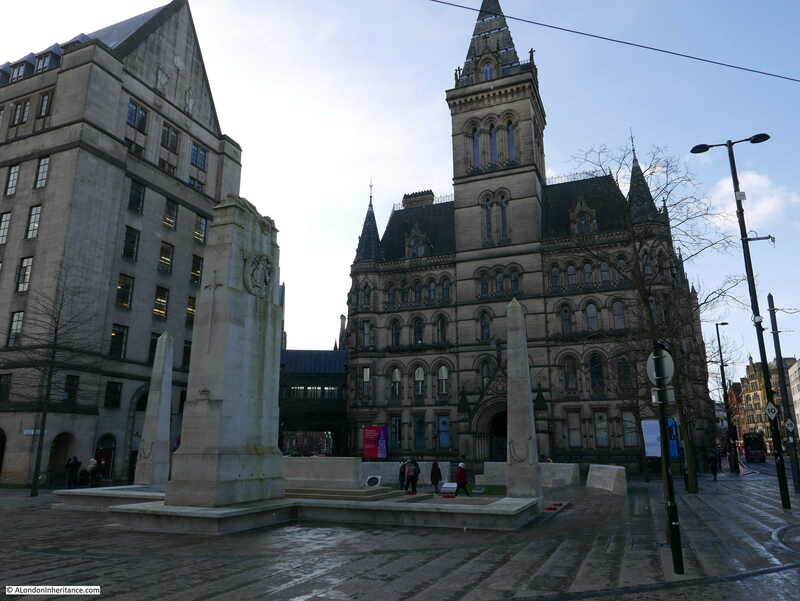 In my 2018 photo above the Cenotaph is missing. 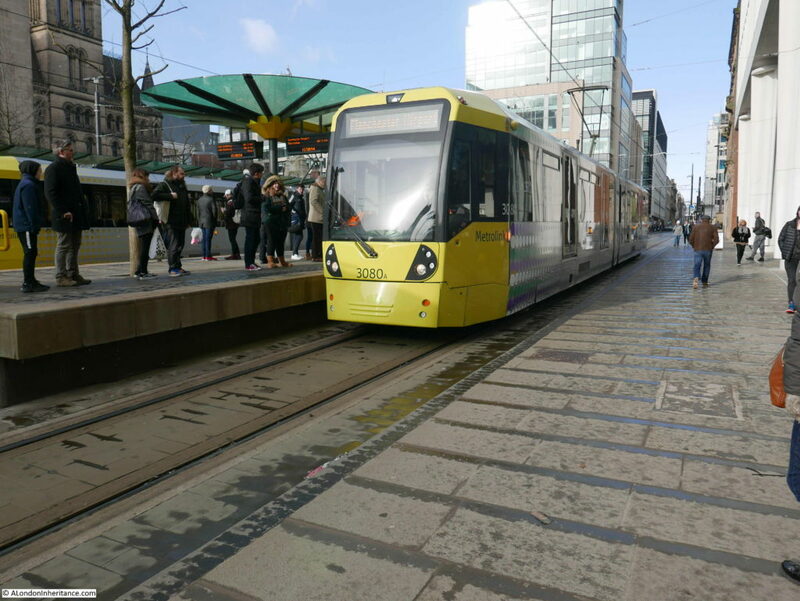 The area in front of the Manchester Central Library and along St. Peter’s Square as it runs to the rear of the Town Hall is a focus for the Manchester Metrolink Tram System with multiple tracks running through the square and along the streets that radiate from the square. 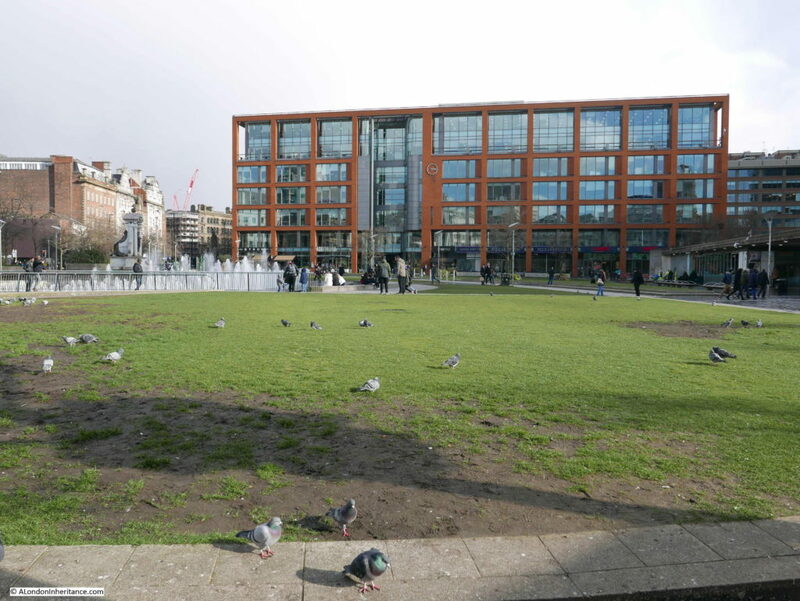 On the walk to Piccadilly Gardens, I had my camera in my pocket as I walked through the occasional showers of snow and biting winds. At some point, one of the settings on the camera got moved so my photos are slightly over exposed. 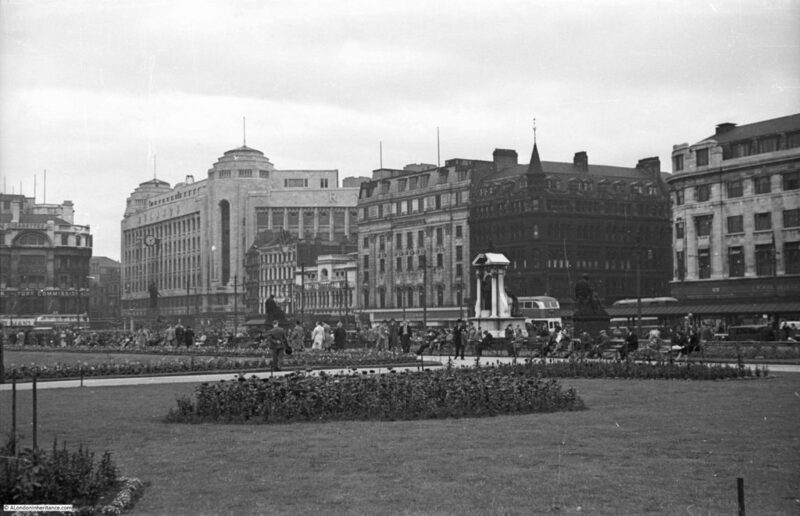 This is my father’s photo looking across Piccadilly Gardens from the south-east. 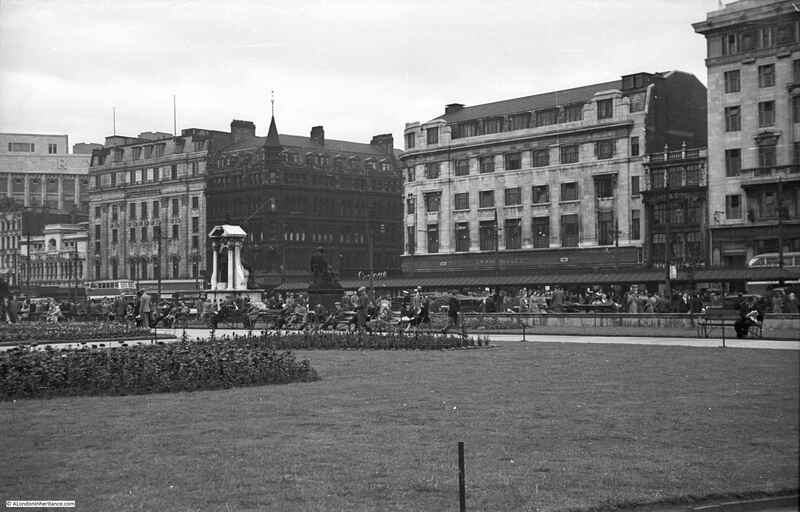 The monument to the right of centre is to Queen Victoria. The perspective of the two photos is different as I could not get into the same location as my father. 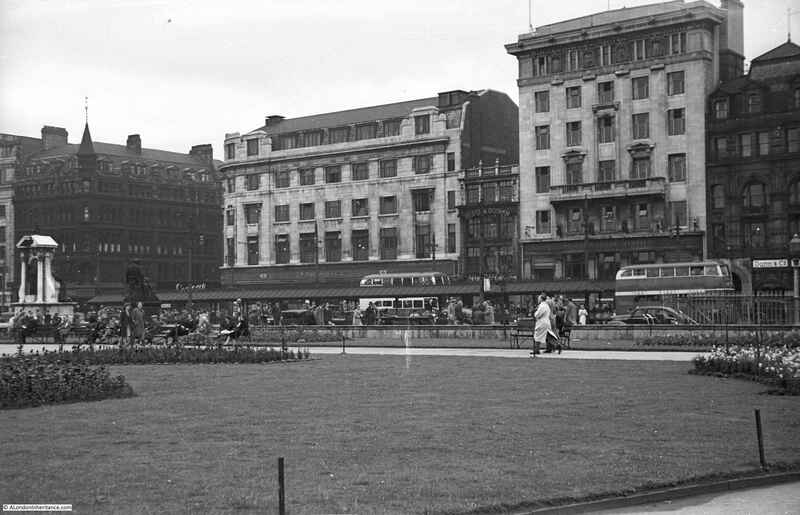 The area from where he took the photo is now occupied by the building One Piccadilly Gardens. One Piccadilly Gardens is shown from across the gardens in the photo below. The building opened in 2003 as part of the redevelopment of the gardens, although it was controversial due to the sale of part of the gardens for private development. 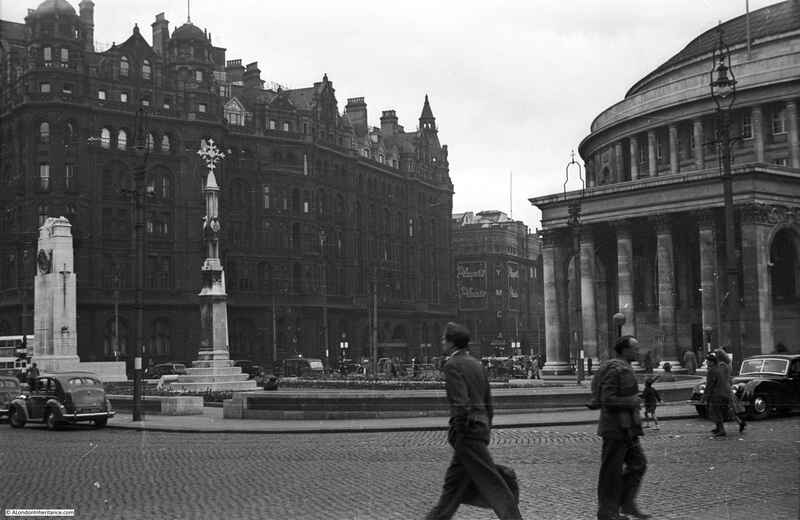 In the above photo there are two taller buildings with a smaller building squashed in between – this was in 1949. 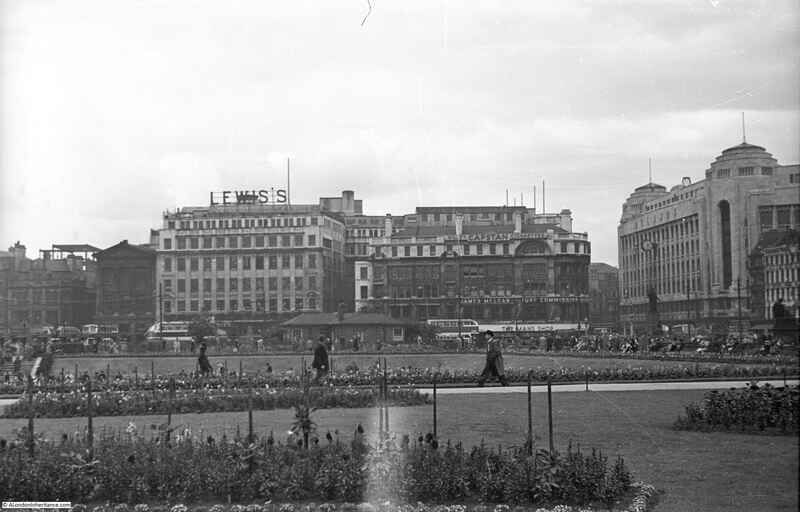 Forward to 2018, and the two taller buildings are still there, however the smaller building in the middle has disappeared. the building on the left has expanded to take over the space. The view across to the western side of the gardens. The building was originally constructed for the Rylands textile company in 1932. 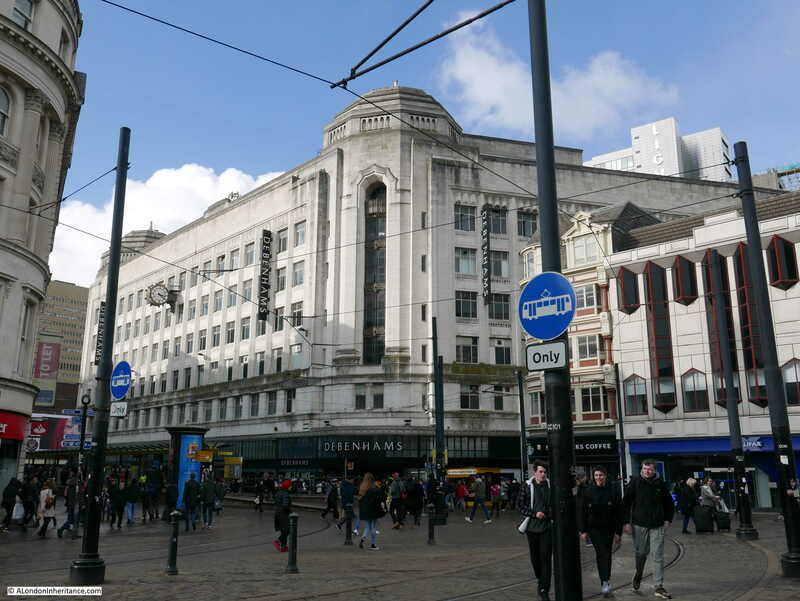 The upper floors provide warehouse space for the company with the ground floor being used as space for shops. 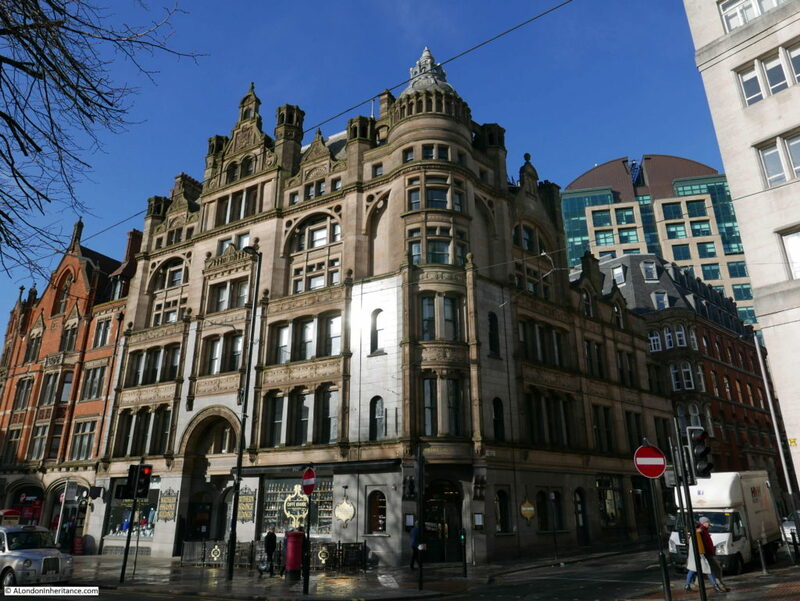 The architecture of Manchester is fascinating and many of the 19th and early 20th century buildings constructed during Manchester’s development as one of the major industrial cities of the country can still be found. 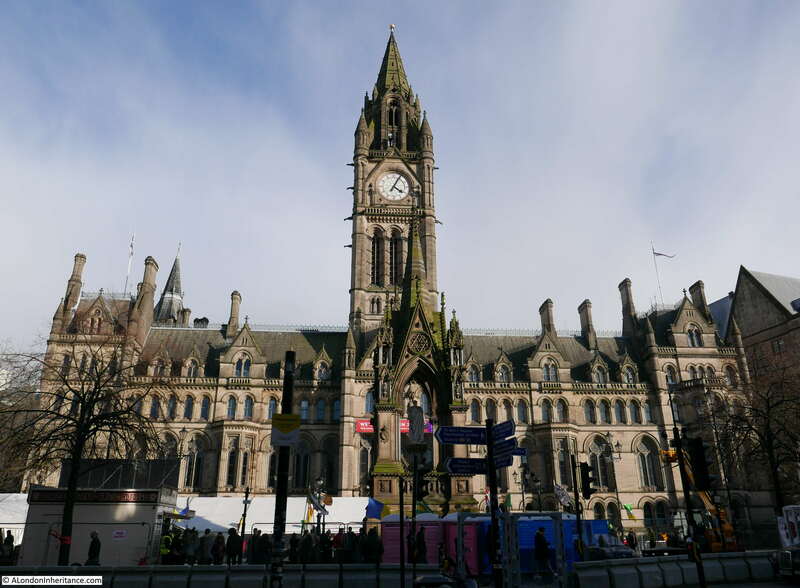 My time walking in Manchester was all too short. There is so much fascinating architecture and history to be explored, I will have to return, however even with the freezing weather I was pleased to find the location of some more of my father’s photos. This entry was posted in Cycling Around Britain and tagged Manchester, Manchester Central Library, Piccadilly Gardens on March 25, 2018 by admin.